Sales Process Optimization With "The Challenger Sale"
The quote made famous on the big screen with this summer’s Wolf of Wall Street when Leo DiCaprio tells his misfit gang of sales reps to “sell me this pen”. The misfit sales rep tells him to write his name on a piece of paper. When Leo says he doesn’t have a pen, the rep’s point is made: Supply and demand. Create a sense of urgency. This sales method may work in some situations, but in today’s sales environment, creating a sense of urgency simply isn’t enough. The way decision makers make purchasing decisions has evolved to a complicated and sophisticated process. There needs to be a sales process to match it. Enter The Challenger Sale, the best-selling book from CEB’s Matthew Dixon and Brent Adamson. The Challenger Sale highlights key findings of CEB’s study of over 6,000 sales reps across different industries and regions. Through a brief history of sales process optimization, an analysis of the evolution of the sophisticated purchasing process, and an explanation of the 5 key selling profiles that emerged in the study, The Challenger Sale explains how The Challenger is the most successful and highest performing sales rep. The Challenger approaches customers with useful insights and offers valuable recommendations. The defining characteristics of The Challenger: teach for differentiation, tailor for resonance, and take control of the sale. The groundbreaking study uncovers why The Relationship Builder sales rep is not the most successful, despite what most people have thought for decades. For those reps that tell you “it’s all about relationships,” The Challenger Sale is here to prove them wrong. Before we delve into these sales profiles, we must first understand where the need for The Challenger rep arose from. Dixon and Adamson point out four crucial trends that explain why consumer buying behavior is evolving so rapidly. More widespread support on purchasing decisions is valued by even the highest level of decision makers. This produces an increased risk to the seller to encounter at least one “no” along the sales process. An increase in the complexity of deals has led customers to require that suppliers share in their burden of the risk. Concerned with seeing a return on their investment, decision makers are measuring the success of suppliers on the performance of their business, rather than on the performance of the supplier’s products and services. Customers want their solutions to be customized for their specific needs. They argue that if it doesn’t meet these needs then it is not really a solution to their problem. And if a supplier can’t give them what they want, they will go to their competitors that will. Again owing to the increase in complex deals, third-party consultants have arisen to help customer’s navigate the complicated purchasing process. This leaves sales reps with yet another obstacle. Not only are they seeking approval from decision makers within the purchasing organization, they are also tasked with proving the validity of their solutions to third-party consultants that “have the customer’s best interest in mind” (aka, looking for their fair share of the deal as well). These trends have led us to the modern-day buying process and the need for sales process optimization. Here to save the day? The Challenger. To understand how to transform your sales force to one that is able to navigate the increasingly complex decision making processes, we look closer at The Challenger sales rep as your solution. The Challenger is so different from his counterparts for one key reason: he challenges prospects to better understand their goals and challenges. Prospects don’t always know they have a problem. Or they may think one thing is their problem, when actually another is. Challengers are here to provide business insights about the prospect’s company so that they are more educated and capable of making decisions. Further analysis looked at the differences between The Challenger profile against The Relationship Builder. 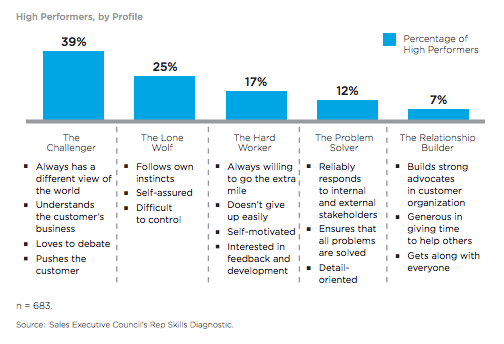 The Challenger made up 39% of high performers and 23% of core performing sales reps. The Relationship Builder only made up 7% of high performing sales rep and 26% of core performers. These statistics are key in proving that The Challenger is the higher performing sales rep.
How does The Challenger get the job done? Challengers offer customers a unique perspective on their business industry. They lead conversations with insights about the customer’s business and how to apply them to compete more effectively in their market, rather than offering their products and services as solutions. They challenge the prospect to think. The Challenger tailors each message for the prospect’s unique business needs and goals. What is the prospect hoping to accomplish? What is their value-driver? Tailoring the message is what makes it resonate with your prospects. A Challenger must be assertive in two ways. First, they must take control of the conversation around pricing and assert an emphasis on value. Second, they must challenge the customer’s thinking and decision-making cycle to shorten the process. 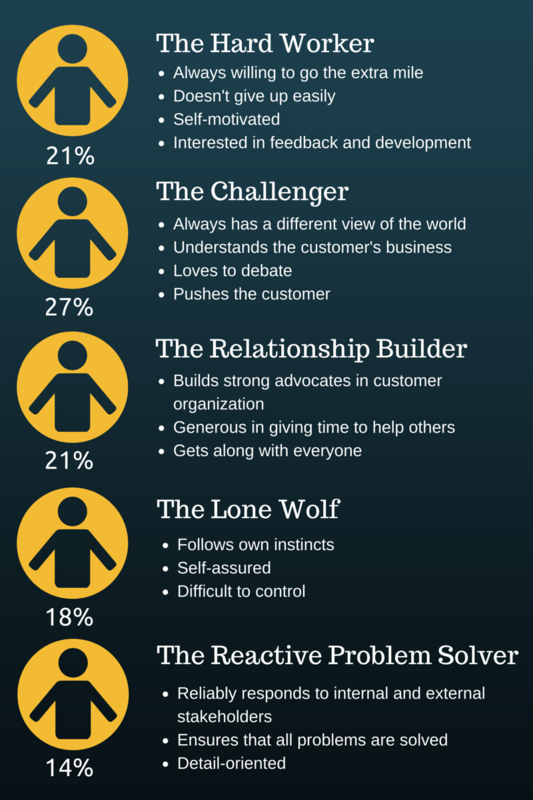 Where does your sales force stack up? Can you identify Challengers in your organization? If not, it may be time to rethink your sales strategies. Use this helpful assessment from CEB for your sales reps and help them identify the strength of their Challenger abilities. To create a sales team of high performers to combat the increasing complexities of the decision-making process, a new sales approach may be needed. The Challenger Sale offers unique perspectives on how business goals can be achieved in this new selling environment. We highly recommend this book to any sales manager looking to spark some fire in his team.